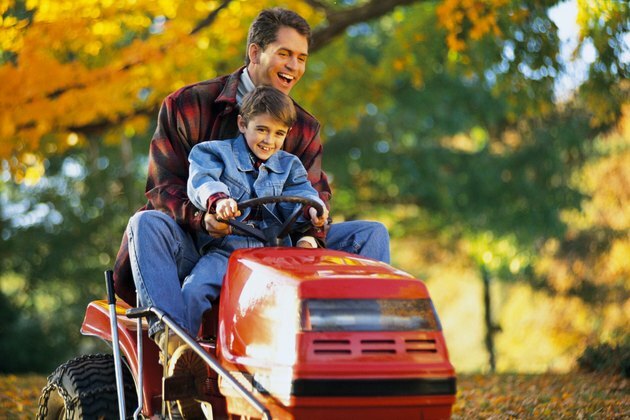 The Cub Cadet lawn tractor is one of the longest lasting and top performing yard tractors today. A myriad of attachments are available for the Cub Cadet, however, in snowy climes one of the most coveted attachments may be the snow blade. It allows you to turn your Cub Cadet into a veritable snow-plowing machine and is easy to attach once you have the frame mounted and secured. The first step of installing a snow plow is to mount the frame on the lawn tractor. Situated like a reversed hitch, the snow plow frame runs along the underside of the tractor frame, providing stability and strength against twisting when the snow plow is put under load. Use a set of pliers to remove the cotter pins in the mowing deck and slide it out of the way. Slide the snow plow frame onto the tractor frame and bolt into place using the socket wrenches and mounting hardware included in the packaging. With the snow plow frame installed, it is time to install the snow plow itself. Have a friend help you situate the snow plow in front of the mounting bracket protruding from the front of the Cadet. Lift the snow plow up onto the mounting bracket and slide the mounting pin into the rear of the snow plow blade. Insert the cotter pin into the mounting pin to hold it in place and then release the snow plow. Now that the blade is mounted, it is time to adjust it to be able to plow some snow. A handle on the top of the blade controls side-to-side movement and another on top of the mounting bracket controls the height of the blade. Adjust the height so that the blade is half-inch above the ground, sitting on a flat surface, then adjust the angle of the blade to one of your preference. The sharper the angle, the faster snow will be be moved away from the blade and to the side of the path.